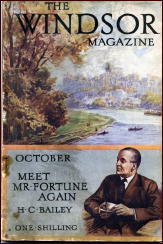 » Reviewed by Curt Evans: H. C. BAILEY – Two Mr. Fortune collections. 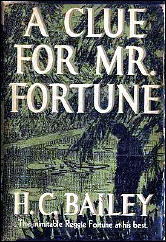 Reviewed by Curt Evans: H. C. BAILEY – Two Mr. Fortune collections. ● Mr. Fortune Objects. Victor Gollancz, UK, hardcover, 1935. Doubleday Crime Club, US, hardcover, 1935. ● Clue for Mr. Fortune. Victor Gollancz, UK, hardcover, 1936. Doubleday Crime Club, US, 1936, as A Clue for Mr. Fortune. Paperback reprint: Pony Book #52, US, 1946. Despite his one-time prominence during the Golden Age of the detective story, H. C. Bailey is not that well-known today, outside the community of knowledgeable collectors. Bailey’s tales of the brilliant deductive deeds of his two series detectives, doctor Reggie Fortune and lawyer Joshua Clunk, frequently are first-rate, however. Clunk appeared only in novels, Fortune in both short stories and novels. Both then and now, the Reggie Fortune short stories probably were/are Bailey’s most highly regarded achievement in mystery fiction. 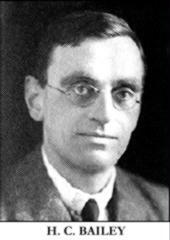 There are, I believe, 85 Reggie Fortune short stories, published between 1920 and 1940 — an impressive body of work. If not quite on the level with the Father Brown stories of G. K. Chesterton, they certainly rank high among mystery short stories and are deserving of some sort of reprinting, certainly at the very least a “best of” volume. Here I review two strong Reggie Fortune collections from the mid-1930s, Mr. Fortune Objects (1935) and A Clue for Mr. Fortune (1936). 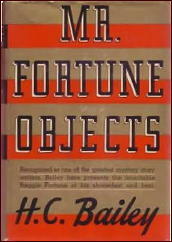 One of the best Reggie Fortune collections of short fiction is one of the rarest of them all, Mr. Fortune Objects. This volume contains six long stories: “The Broken Toad,” “The Angel’s Eye,” “The Little Finger,” “The Three Bears,” “The Long Dinner” and “The Yellow Slugs.” All are good tales, while three — “Toad,” “Dinner” and “Slugs” — are among Bailey’s very best short works. In his day as well as today, the detractors of Reggie Fortune (who included Julian Symons) deemed him a tiresome, precious creation. Reggie’s mannerisms, of which the author often makes a great deal, can be tiring. His speech is telegraphic (like Charlie Chan, who is sparing of pronouns, Reggie is sparing of verbs), affected and arch, he moans and mumbles, and he spends much time fussing over Darius, his blue Persian cat, and his elaborate luncheon and dinner menus. All this is granted. Yet Reggie also is a legitimate Great Detective, filled with a fervor, quite remarkable for the period, for justice. This moral fervor comes through strongly in Mr. Fortune Objects, in tales that deal in a mature, thoughtful way with the existence of evil in the world. In “The Broken Toad” (a brilliant title for a story that first appeared in the October 1934 issue of Windsor Magazine), the arsenic poisoning of a policeman leads Reggie, in his capacity as medical consultant to Scotland Yard, into a remarkable case of suburban dysfunction. Arguably Bailey’s best tale, Toad is suspensefully and vividly told and there is much genuine detection (some having to do, appropriately enough, with food). In “The Long Dinner,” a menu and the strange drawing on the back of it lead Reggie into the maze of a diabolical murder scheme. A serious moral question is explored here. Reggie is pretty intuitive here, but the plot is quite interesting. Reggie also reunites with his detective friend from France, who is a good character. In “The Yellow Slugs,” one of the better-known Fortune tales (it was anthologized by Dorothy L. Sayers), Bailey delves interestingly into child psychology. Bailey often dealt with threats to children in his works and could sometimes be tiresomely sentimental, but “Slugs” is not overdone in this regard and in fact is rather realistic, modern and dark. Reggie also does some real detective spade work here, rather akin to what one might find in an R. Austin Freeman tale. “Toad” and “Slugs” are particularly striking in that they are far removed from the aristocratic country house/quaint village settings so often associated with British Golden Age mystery. Instead, they focus on severe moral dysfunction in more modern-feeling suburban and urban settings. The three other tales are worth reading as well, especially “The Angel’s Eye,” which was praised by Jacques Barzun. This one actually is set in an English country house and involves a locked room problem of sorts (though anyone expecting John Dickson Carr will be disappointed). None perhaps has the depth of “The Broken Toad,” “The Long Dinner” or “The Yellow Slugs,” but several rank near the top of the Bailey works, being quite clever and entertaining. Reggie Fortune is still bountifully bedecked with mannerisms some might fight irritating (he seems to have picked up the habit of quoting extensively in these later tales, though, thankfully he now looks less at people with the wondering eyes of a child), but he seems a mite less precious and more impressive in his role as an instrument of justice. With “The Torn Stocking” we again see the exploration of a favorite theme of Bailey’s, that of the consequences of family dysfunction. The milieu is rather shabby urban middle-class. Reggie investigates the seeming suicide (head in the gas oven) of a teenage girl accused of shoplifting, with surprising results. His detective work is quite interesting. “The Hole in the Parchment” sees Reggie and wife Joan vacationing in Florence, Italy (a number of the Fortune tales takes place in France, Germany and Italy). There the two become involved in a case involving theft and forgery, quite cleverly done. In “The Holy Well,” Bailey gives bravura treatment to a classic detective story device. The story involves murder in rural Cornwall. Both the atmosphere and the plotting are first-rate. 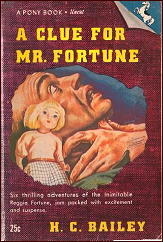 Both Mr. Fortune Objects and Clue for Mr. Fortune are fine mystery short story collection that merit reprinting for a modern audience. Frankly I didn’t find Reggie Fortune to be a great deal more annoying than Lord Peter could be, and I was delighted when I found the books to find a writer who could compete with the greats in the field. I had read so many complaints about Reggie’s mannerisms and the sentiment about children that I was expecting the stories to be a pain and Reggie a chore, but instead I found well written clever tales (as you say he is a master of the short form) with Reggie a vivid (if sometimes annoying) and often impassioned sleuth. To some extent that passion sets Reggie apart from many of his cooler headed more dispassionate contemporaries. Reggie can be annoying, but he is never merely silly. I’m afraid I haven’t read as much Bailey as I would like. A handful of Reggie’s adventures and one or two Clunks, but these really are forgotten jewels, and sadly neglected because of a small group of critics who were some how offended by Reggie’s mannerisims (as you say Symons was particularly savage). Thanks for doing this one. Maybe a few readers will check out Reggie and Joshua Clunk now (at least one of Reggie’s adventures can be found on line). Reggie and Bailey may not be quite in the very first rank of the Golden Age, but they are much closer to it than their neglected status reveals. Unlike Anthony Wynne, who is pleasant, but not really first rate even at his best, Bailey is an excellent writer, Reggie a fine creation, and the short stories in particular among the most entertaining of the age. Anyone who enjoys the Golden Age mystery should be delighted to discover Bailey and Reggie, they really are lost classics of the form. I’ve never read any Bailey. This encourages me to search him out. Perhaps you could report back when you do. I’m getting conflicting reports on Bailey, both from emails and comments and reviews I’ve read online. Bailey seems to be an acquired taste. Either you love/like his work, or you can’t read him. I’ve read one of his novels, one with Joshua Clunk, and several of his best-known short stories. The novel was OK, but I found nothing in it to convince I ought to be reading more. The short stories were a long time ago, but I do remember enjoying them. And based on Curt’s review, I’m encouraged enough by it to search Bailey out myself. Any that I happen to have read before will be like reading them for the first time, a clean slate, literally. I went back and looked at Julian Symons’ comments on Bailey’s work and they are so dismissive they make his comments on Freeman Wills Crofts look warm by comparison. I think they do a disservice to Bailey, however. I initially found Reggie’s personality rather irritating, but I got used to it, mostly. Sometimes Bailey overindulges in the mannerisms (as he does with the innocent, lisping children), but one shouldn’t let that obscure to frequent clever plotting, legitimate detection and moral insight. People often throw the term cozy at Golden Age series, but when you take a closer look at these Fortune stories you often see some remarkably wicked people and pathological cases. I just reread the first Fortune collection, and it is the closest to fitting Symons condemnation as whimsical and precious. But Bailey improved markedly with the second collection in my view. What makes Symons’ overbroad criticism a shame is that Bailey ended up often exploring psychology and criminal pathology in the more serious manner of the crime novel, something Symons celebrates. Which isn’t to say the tales don’t get on my nerves sometimes. “The Greek Play,” which is a clever story and deemed a masterpiece by Barzun, opens with a passage concerning Reggie and his cat that is so precious it made me want to throw the book out the window. But this doesn’t happen too much. Alluding to something David wrote, I think one explanation for why people let Lord Peter (and Campion too) off the hook for affectation is that they see him still as a romantic hero. No one can see Reggie as a romantic hero, even though he has a charming, attractive wife. He’s fat too indolent and childlike. But Reggie does have a great passion for righting wrong (as well as eclairs and hazel ices, etc.). Clunk is an interesting idea (the “pious” defense attorney), but as a series protagonist I am still having a hard time getting a handle on him. I tend to like the Reggie Fortune novels less, as they feel more padded in comparison with the short stories, which work so well because they center so strongly on Reggie (if you can stand him). Curt, re the third paragraph in Comment #4, the “people” you’re referring to just don’t know what they’re talking about. Given all Bailey’s and Reggie’s faults as outlined by Curt — and he is probably being kind — what Reggie and Bailey represented for me was a previously unknown ‘master’ of the Golden Age who had done some first rate stories in the classic form, and who I only knew from one or two reprinted stories scattered among the standard anthologies. After you have read most of the obvious masters, and even moved on to a few of the lesser (often undeservedly) knowns (Wade. Adams, Wynne etc.) it was something of a revelation to find Reggie and discover the writing was (usually, or at least often enough) of the first water — in the shorts, I agree with Curt about the novels. The great knock against Bailey and Reggie has to do with the “precious” bits Curt mentions, over sentimentality, and Reggie’s status as a sort of child man — and certainly the series would be better without them, but they aren’t so intrusive you can’t find some good material along the way. And in an odd way, annoying as they may be, because of them Reggie emerges as a genuine character, fully imagined and (pardon the term in Reggie’s pudgy case) fleshed out. Reggie is more fully developed as the series progresses where in all fairness there are at least three distinct Campions who haven’t much to do with each other and two Wimsey’s it can be hard to reconcile. Bailey grows Reggie rather than reinvents him. And of course, Curt is dead on about the romantic hero aspect of Lord Peter and Campion, though frankly I think that card was overplayed by Sayers. Indeed, considering all those walking wounded secretly Byronic types haunting the genre Reggie might almost be a tonic at times. Other than his compassion for children and a passion for justice, the only thing likely to haunt Reggie is if he runs out of sweets. Clunk is a bit harder to appreciate. Like Curt I haven’t warmed to the series. Perhpaps neither of us has run across the right adventure yet — or maybe this is the reason he was in Reggie’s shadow ( I think I read somewhere that he appeared in some of the Reggie books or stories but haven’t run across them). But when you have read the top shelf of the Golden Age and you begin to look for something new Bailey and Reggie are a great discovery so long as you can get past some of the worst bits of precious writing. Frankly I don’t find them all that ‘cozy.’ Even Miss Marple, who is as close as Christie comes to cozy is a tough minded and rather cold blooded old lady, and in Christie at least young love and true love don’t lead to happily everafter, but murder. You could write a dissertation on the number of times lovers turn out to be murderers in Christie. But the only thing cozy about many of the Golden Age mysteries was that was that their language and manners were polite while they committed their crimes. Some of these short stories are available at http://www.munseys.com. But the author name listings are messed up, so you just have to search for “Bailey” and scroll down through the list. I’ve stated this on the GAD forum and think it bears repeating. The best way to read HC Bailey mystery fiction is in chronological order. The “Call Mr. Fortune” tales are a wonderful introduction. If you find yourself unable to enjoy them–a fair enough position–thre’s not much point in continuing to the later collections or the novels. Reggie’s converstaional style, and Bailey’s style, bcomes somewhat more obtuse with each volume. By the time one attempts to read the final few publications, I believe, one must be a true devotee of Bailey to even get through much of each one. To enjoy such a book as “Saving a Rope” may be pretty rare. I continue to read Bailey as a devotee, but cannot say I love everything he wrote. Still, I firmly believe Fortune to be among the greatest of Golden Age detectives, and I contend there is much in the Clunk novels (humor ranks high) to commend them. Each of these characters was completely original, IMO. Bailey’s particular mixture of the devious and the pious in Clunk is particularly delicious at times. He is a first-class manipulator of bpth people and evidence. Fortune, from the beginning is almost excessively sympathetic to the down-trodden, and willing to circumvent the accepted policing methods to spur criminals to action (thereby making mistakes) or to bring about the demise of the villain on Reggie’s own terms. His belief in evidence alone and his contention that he has no imagination (which should not be used in any case) is an endearing trait and a fascinating contrast to Holmes, who prized the use of imagination. Mannerisms or no, I’ve always had a special fondness for Reggie Fortune. My parents had the green Penguin Mr Fortune, Please, and I’m surprised nobody else seems to rate The Little House as highly as I do. I’ve recently used the internet to buy my own copy, plus the two story collections. As I hate reading on screen and just got directed to the Munsey site (thank you), I’ve printed out the two collections. I sample these sparingly to prolong the pleasure! Reggie is due for a comeback – with affordable reprints of the short story vols. Am going through a phase of buying classic detective stories. Usually, but not always, British. This phase has stayed for while, unlike other ideas in the past. Bought and just finished reading Black Land, white Land. Not bad and the hero is certainly not more irritating than Lord Peter W. But I think everyone is right. The short stores would be better.Have failed to find any online agent (Amazon included) selling these two books – or indeed any of the Bailey short story collections. Would anyone care to tell me where to look since Google doesn’t? I’ve sourced some more short story Fortune books since making the above comment. prices vary – you can be lucky. I’ve used ABEbooks, ebay and Better World Books, and others apart from the two Munseys are available to read on line, though they are not as easy to print out to put it politely. I just came across this blog, in my intermittent search for more Reggie Fortune stories. I have tried one or two of the novels, and like the short stories better. I, too, think The Little House is one of the best. Very few stories of almost 100 years ago deal with child abuse. The Yellow Slugs, also, to a lesser degree. I must have missed the ones with excessive sentimentality – or else I have read enough late Victorian literature to have toughened up. My frustration is with the same stories appearing in different collections. I own about four of the collections. While I do not own either of the collections reviewed here, my collections include four of the stories in Mr. Fortune Objects, and three of the ones in A Clue for Mr. Fortune. Since ABEbooks, etc. rarely list the stories in a collection this makes getting new ones difficult. Thanks for the Munsey link.